This little giraffe diaper cover and matching hat from Nat & Jules is simply adorable! Regularly $26.50, you can grab this right now for only $9.09! You are going to want to snag this before the price goes back up! Only the pink is available at this price. The cuteness, I just cannot resist with this item. Check out this absolutely adorable giraffe diaper cover and matching hat over on Amazon.ca today that is great to use for Halloween, or for an absolutely perfect newborn or baby photo session. If you are a photographer for babies and kids, this little costume would be so sweet to add to your prop collection. 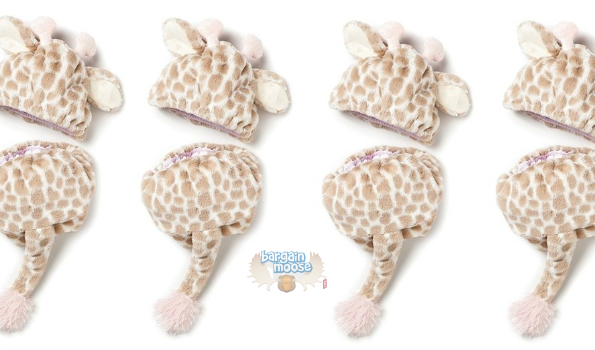 This set includes a super soft giraffe hat complete with ears, and a matching cuddly diaper cover with a tail. There are soft baby pink accents on the tale of this costume. This set is designed for ages 0-6 months and is completely machine washable. If you are not familiar with Nat & Jules, they are known for making amazing plush stuffed animals and are often found in smaller kid themed boutique stores. They have a small line of baby items that includes this adorable costume. Nat & Jules falls under the larger Enesco brand, which makes the popular Willow Tree figurines also among many other boutique type products for kids and the home. I would expect this giraffe costume to be a higher quality costume. This item is hard to price compare. There is not much on the market that is sold online here in Canada that is similar. I did find a super soft giraffe diaper cover over at Funky Fleece for $18. This only includes the bottoms and does not include that adorable hat with the ears. Shop.ca has a newborn costume that covers from head to toe for $23.70. This costume is fuzzy and warm, but it is going to be difficult to see the baby in photos with this costume. This type of costume is more so for Halloween Trick or Treat and is not really designed for adorable baby photos. There are many more similar handmade options on Etsy that are available to purchase, but most start in the $30 range. This giraffe set ships directly from Amazon.ca and qualifies for free Super Saver Shipping if you spend $25. If you have Amazon Prime, this item will ship to your house completely free. Amazon Prime makes snagging these deals easy, as you will always have free shipping. It sure makes snagging great deals easier if you can avoid shipping costs altogether. This is an adorable item, and you will spend much more trying to track down a baby costume prop as cute as this. I would expect an outfit like this to run between $30 to $40 at a baby boutique or specialty store that carries cards and gifts. Grab it now as a gift, or for your photo session or for your photography business as a prop!